How to fix “This plug-in is not supported” error on Chrome? 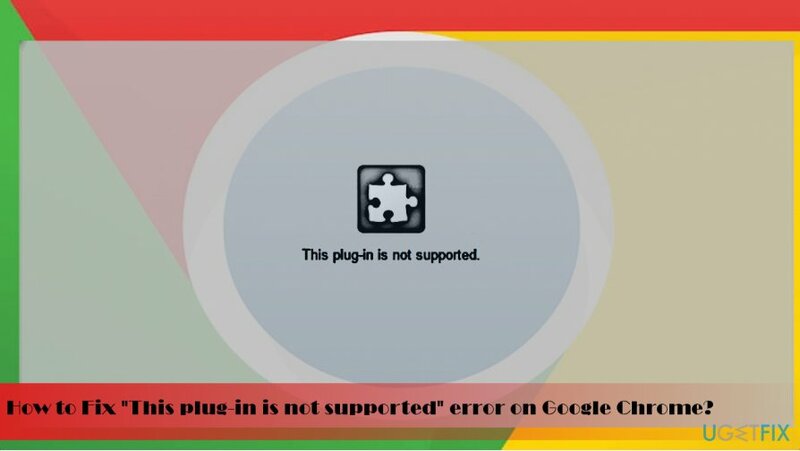 Home »	Fix » How to fix “This plug-in is not supported” error on Chrome? Issue: How to fix “This plug-in is not supported” error on Chrome? Seeing an error “This plug-in is not supported” on Chrome. It shows up on random websites. I haven’t installed any new plug-in, so I wonder what I should do. Please help. IE, Edge or Firefox can help you to access websites, which are blocked on Chrome by the “This plug-in is not supported” pop-up window. If you are using Google Chrome’s version 45 or higher, you must know the fact that it does not support Java plug-in anymore. Therefore, Chrome may not load websites that require Java plug-in. To check that, simply open Firefox, Edge or another browser that you prefer visiting and check the “This plug-in is not supported” error disappeared. Outdated or missing Adobe Flash Player may also cause “This plug-in is not supported” on Chrome. Therefore, you should visit the official website of Adobe and download the latest version of the player. Once done, reboot the system and try to visit the website that previously wasn’t loaded due to the unsupported plug-in. Launch Google Chrome and press Ctrl + Shift + Del simultaneously. Select to clear browsing data from the begging and click Clear browsing data button. Wait while the process is being executed and then restart Chrome. Additionally, don’t forget to update Google Chrome to the latest version regularly and optimize the system using Reimage or another professional utility.